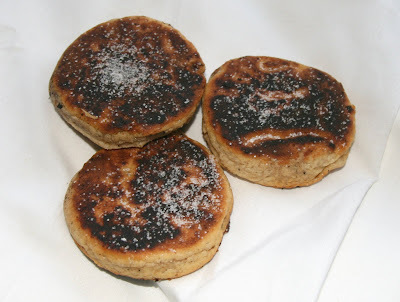 Since yesterday, Joseph has been nagging about making Welsh Cakes, but yesterday's fare took too long to start thinking about that. So, I made a deal that if we made them today, he would have to eat the fish ball things I was planning for later that day in return. Seemed like a good exchange to me. Also, it meant that I had a little helper to rub the flour and butter together so that I could carry on with working while Joseph got it to a breadcrumb texture. Not having all the correct equipment to make these stove cakes was not a great problem. We used an empty wine bottle as a rolling bin (as was used yesterday for the pastie dough), glass to cut them out, and a big cast iron pan to cook them in, and so, presentation isn't perhaps their strong point, but they still came out better than the Welsh Rugby Team did against Scotland last weekend. Also, Sally was still at work, so I had to struggle with the photography myself. First, you need to rub the Butter into the Flour using your fingertips until it is the texture of breadcrumbs. Next add the Sugar, Sultanas and Mixed Spice and mix them altogether. Then add the egg and form into a slightly sticky dough. You can add a little milk if it is too dry, but I never need it. Now just roll out the dough so that it's about 5mm thick and cut into circles of about 10cm in diameter. The pan should not be too hot and only lightly greased with a little butter before cooking the cakes. They should take a few minutes each side then can be served right away, the fresher the better.